2. Internal copper tube with the method of mutual crisscross, can effectively guarantee the copper and aluminum perfect combination, has the very good heat exchange quality. 3. Our side wind air-cooled condenser through strict factory inspection tests (including air tightness test and sewage treatment system, etc. ), with reliable quality assurance. 4. The side wind air-cooled condenser can is suitable for various kinds of refrigerants, use rise very convenient. 6. 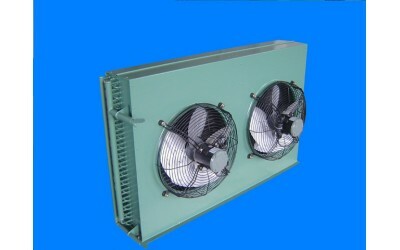 The outlet air condenser side also can be equipped with the professional quality of condensing units to use.